Abstract: While the initial treatment of non-small cell lung cancer (NSCLC) usually relies on surgical resection followed by systemic cytotoxic chemotherapy and/or radiation therapy, recent advances in understanding of NSCLC biology and immunology have spurred the development of numerous targeted therapies. In particular, a class of immune modulatory drugs targeting the immune checkpoint pathways has demonstrated remarkable durable remissions in a select minority of advanced NSCLC patients, potentially heralding the elusive “cancer cure”. This review focuses on the clinical evidence for one of these agents, nivolumab, and clarifies the role of this drug in the context of the other targeted therapies currently available for the treatment of NSCLC. We also discuss the impact of nivolumab on patient quality of life and health economics. Lung cancer continues to be one of the top five causes of cancer-related mortality, with non-small cell lung cancer (NSCLC) being the most common subtype. This category is subdivided further based on pathology into adenocarcinoma and squamous-cell and large-cell NSCLC. When diagnosed early (stage I and stage II NSCLC) and surgically resectable, it generally has a good prognosis. However, the treatment of advanced, recurrent, and metastatic NSCLC is often associated with significantly poorer prognosis. While the first-line treatment consists of surgery followed by systemic cytotoxic chemotherapy, and/or radiation therapy, recent advances in understanding of cancer biology and immunology have spurred the development of numerous targeted therapies (Figure 1) with the potential to dramatically improve overall survival (OS) in specific NSCLC populations.1 Several of these targeted agents are linked to genomic abnormalities in the tumor tissue, and it has now become part of the standard of care to test patients who are candidates for systemic drug therapies for the presence of such mutations.1 More recently, a class of immune modulatory drugs targeting the immunoinhibitory (ie, immune checkpoint) pathways has demonstrated remarkable durable remissions in a select minority of advanced NSCLC patients, potentially heralding the elusive “cancer cure”. 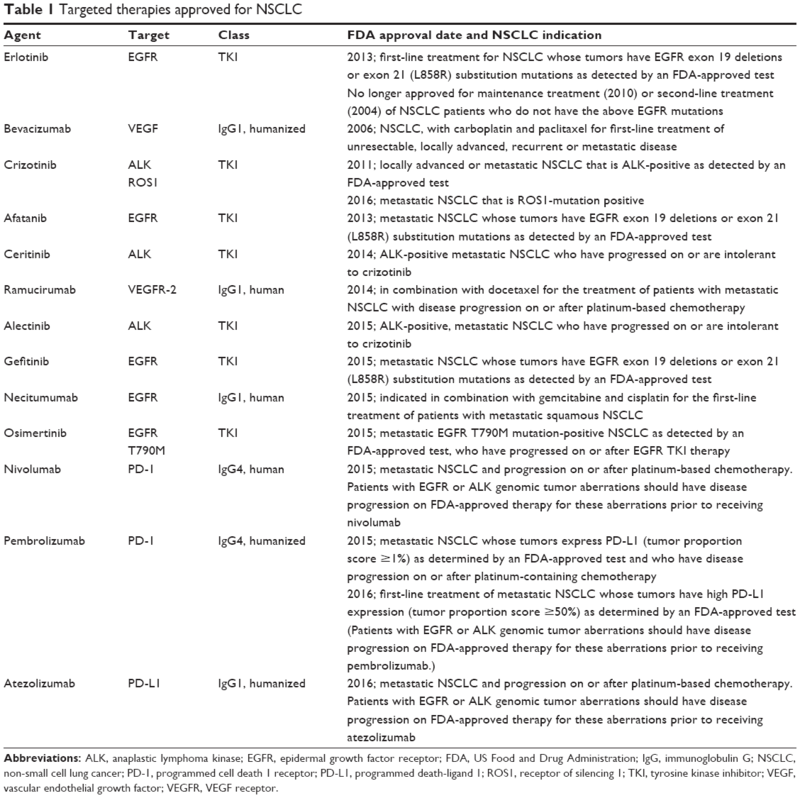 This review focuses on the clinical evidence for one of these agents, nivolumab, and clarifies the role of this drug in the context of the other targeted therapies (Tables 1 and 2) currently available for the treatment of NSCLC. We also discuss the impact of nivolumab on patient quality of life and health economics. Figure 1 Molecular targets in NSCLC. Abbreviations: AKT, protein kinase B; ALK, anaplastic lymphoma kinase; CD, cluster of differentiation; c-Met, cellular mesenchymal to epithelial transition factor; CTLA-4, cytotoxic T-lymphocyte-associated molecule 4; EGFR, epidermal growth factor receptor; EML4, echinoderm microtubule-associated protein-like 4; ERK, extracellular signal-regulated kinase; GRB2, growth factor receptor-bound protein 2; IDO, indoleamine 2,3-dioxygenase; MEK, MAPK/ERK kinase; mTOR, mechanistic target of rapamycin; NSCLC, non-small cell lung cancer; p85/p110, phosphoinositide 3-kinase; PD-1, programmed cell death 1; PTEN, phosphatase and tensin homolog; RAF, rapidly accelerated fibrosarcoma; RAS, human rat sarcoma protein; Rheb, Ras homolog enriched in brain; RTK, receptor tyrosine kinase; SOS, son of sevenless; T790M, EGFR Thr790Met mutation; TSC 1/2, tuberous sclerosis proteins 1 and 2; VEGF, vascular endothelial growth factor; VEGFR, VEGF receptor. Abbreviations: ALK, anaplastic lymphoma kinase; EGFR, epidermal growth factor receptor; FDA, US Food and Drug Administration; IgG, immunoglobulin G; NSCLC, non-small cell lung cancer; PD-1, programmed cell death 1 receptor; PD-L1, programmed death-ligand 1; ROS1, receptor of silencing 1; TKI, tyrosine kinase inhibitor; VEGF, vascular endothelial growth factor; VEGFR, VEGF receptor. Abbreviations: ALK, anaplastic lymphoma kinase; EGFR, epidermal growth factor receptor; FDA, US Food and Drug Administration; NSCLC, non-small cell lung cancer; OS, overall survival; ORR, objective response rate; PD-1, programmed cell death 1; PFS, progression-free survival; VEGF, vascular endothelial growth factor; VEGFR, VEGF receptor. Cetuximab (Erbitux®; Eli Lilly and Company, Indianapolis, IN, USA), a monoclonal antibody targeting EGFR approved for head and neck cancers as well as colorectal cancer, has shown activity in patients with NSCLC.5 The First-Line Erbitux in Lung Cancer (FLEX) trial was a multinational, multicenter, open-label, Phase III study of 1,125 patients with wet stage IIIB or stage IV NSCLC.6 The addition of cetuximab to chemotherapy (cisplatin and vinorelbine) versus chemotherapy alone showed a minor but significant improvement in OS.6 The median OS was 11.3 months for patients treated with chemotherapy and cetuximab versus 10.1 months for patients treated with chemotherapy alone (hazard ratio [HR] =0.871, 95% confidence interval [CI]: 0.762–0.996, P=0.044).6 Rash was the main adverse event experienced with patients on cetuximab.6 Although the results of this study were statistically significant, a separate study found no difference between chemotherapy alone and chemotherapy with the addition of cetuximab, and the US Food and Drug Administration (FDA) has not approved cetuximab for any indication involving NSCLC. Necitumumab (Portrazza®; Eli Lilly and Company) is an anti-EGFR recombinant human monoclonal antibody indicated, in combination with gemcitabine and cisplatin, for the first-line treatment of patients with metastatic squamous NSCLC originally approved in 2015.7 The FDA-approved dose is 800 mg intravenous (IV) over 60 minutes on days 1 and 8 each 3-week cycle. Necitumumab received its FDA approval based on a randomized, open-label, Phase III study of 1,093 patients with stage IV squamous NSCLC who had not received previous chemotherapy for their disease.8 The addition of necitumumab to chemotherapy (gemcitabine and cisplatin) versus chemotherapy alone showed a significant improvement in OS. The median OS was 11.5 months for patients treated with chemotherapy and necitumumab versus 9.9 months for patients treated with chemotherapy alone (HR =0.84, 95% CI: 0.74–0.96, P=0.01).8 A significant improvement in PFS was also seen in patients receiving necitumumab and chemotherapy (5.7 months) versus chemotherapy alone (5.5 months, HR =0.85, 95% CI: 0.74–0.98, P=0.02).8 The most common adverse events experienced with the addition of necitumumab were rash and hypomagnesemia.8 These improvements in OS and PFS are not as clinically significant as the EGFR-targeted TKIs, and consequently, necitumumab is not as widely utilized. Gefitinib (Iressa®; AstraZeneca, Wilmington, DE, USA) is also a first-generation TKI binding reversibly to EGFR. It initially received accelerated approval by the FDA in 2003 as monotherapy for the treatment of patients with advanced NSCLC after the failure of both platinum- and docetaxel-based therapies based on preliminary results showing an ORR of nearly 15% in a refractory unselected patient population.13 Based on the results from the Iressa Survival Evaluation in Lung Cancer (ISEL) trial where gefitinib failed to demonstrate a significant improvement in OS versus placebo, the FDA updated its label in June 2005 restricting use to patients who, in the opinion of their treating physician, are currently benefiting or have previously benefited from gefitinib. The new drug application for the accelerated approval of gefitinib was withdrawn voluntarily in April 2012, but the knowledge of patients with EGFR-mutated NSCLC deriving benefit from gefitinib was mounting. Ultimately, the FDA reapproved gefitinib in 2015 for the first-line treatment of patients with metastatic NSCLC whose tumors have EGFR exon 19 deletions or exon 21 (L858R) substitution mutations.14 The FDA-approved dose is 250 mg orally once daily with or without food. Gefitinib received its approval based on two studies. The first study, the Iressa Follow-Up Measure Study (IFUM) study, was a Phase IV, open-label, single-arm study of 106 patients with stage IIIA/B/IV, EGFR-positive NSCLC.15 The ORR, the study’s primary endpoint, was 69.8% (95% CI: 60.5–77.7). Secondary endpoints included disease control rate (DCR) (90.6%; 95% CI: 83.5–94.8), median PFS (9.7 months; 95% CI: 8.5–11.0), and median OS (19.2 months; 95% CI: 17.0–not reached). The most common adverse events experienced were rash and diarrhea.15 The second study was an exploratory analysis of a randomized, Phase III, multicenter, open-label trial of 228 patients of chemotherapy-naive advanced NSCLC with sensitive EGFR mutations (NEJ002 study).16 The updated median PFS showed a significant improvement with gefitinib (10.8 months) versus carboplatin/paclitaxel (5.4 months, HR =0.32, 95% CI: 0.24–0.44, P<0.001). The updated median OS showed no difference between gefitinib (27.7 months) and carboplatin/paclitaxel (26.6 months, HR =0.89, 95% CI: 0.63–1.24, P=0.483). Rash and diarrhea were commonly seen with gefitinib. Afatanib (Gilotrif®; Boehringer Ingelheim, Ridgefield, CT, USA) is a second-generation TKI that binds irreversibly to wild-type EGFR and mutated EGFR, with the latter being inhibited at a lower threshold than the wild-type form. It was approved by the FDA in 2013 and is indicated for the first-line treatment of patients with metastatic NSCLC whose tumors have EGFR exon 19 deletions or exon 21 (L858R) substitution mutations.17 The FDA-approved dose is 40 mg orally once daily on an empty stomach. Afatanib received its approval based on a Phase III, randomized, open-label study of 364 treatment-naive patients with stage IIIB or IV, EGFR-positive NSCLC.18 Afatanib had a significantly longer median PFS (11.0 months) versus gemcitabine/cisplatin (5.6 months, HR =0.28, 95% CI: 0.20–0.39, P<0.0001). Diarrhea, rash, stomatitis/mucositis, paronychia, epistaxis, pruritus, decreased appetite, and fatigue were seen most often with afatanib. Osimertinib (Tagrisso®; AstraZeneca) is a third-generation TKI originally approved by the FDA in 2015 and is indicated for the treatment of patients with metastatic EGFR T790M mutation-positive NSCLC who have progressed on or after EGFR TKI therapy.19 The FDA-approved dose is 80 mg orally once daily with or without food. The significance of this approval is that it overcomes the EGFR T790M resistance mutation, a substitution of threonine with methionine at amino acid position 790 on EGFR, which accounts for 60% of acquired resistance to EGFR TKIs.20 Original approval came from two multicenter, single-arm, open-label, Phase II trials consisting of T790M-positive advanced NSCLC patients who progressed on EGFR TKI therapy.19 Recently updated data from a preplanned pooled analysis of these two Phase II studies, consisting of 411 patients, showed an ORR of 66% (95% CI: 61–71), a median duration of response of 12.5 months (95% CI: 11.1 months to–not reached), and a median PFS of 11.0 months (95% CI: 9.6–12.4).21 Common adverse events with osimertinib were rash and diarrhea. Although osimertinib was developed to overcome acquired resistance to first- and second-generation TKIs, it is increasingly evident that acquired resistance to even the third-generation TKI is possible through mechanisms such as the C797S mutation in exon 20 that impairs covalent binding of the drug to EGFR. Crizotinib (Xalkori®; Pfizer, New York, NY, USA) is a multikinase inhibitor and binds ALK, hepatocyte growth factor receptor (HGFR; c-Met), ROS proto-oncogene 1 (ROS1), and recepteur d’origine nantais (RON). It was the first TKI approved for ALK-positive advanced or metastatic NSCLC.25 The FDA-approved dose is 250 mg orally twice daily with or without food. Crizotinib received its approval based on two clinical trials.26 The first trial was a multicenter, single-arm, Phase I study consisting of 116 evaluable patients with ALK-positive advanced NSCLC. The ORR was 61% (95% CI: 52–70) with two complete responses and 69 partial responses. The median duration of response (DOR) was 48.1 weeks (range: 4.1–76.6 weeks). The second trial was a multicenter, single-arm, Phase II study consisting of 135 evaluable patients with ALK-positive advanced NSCLC who had progression after at least one line of chemotherapy. The ORR was 50% (95% CI: 42–59) with one complete response and 67 partial responses. The median DOR was 33.1 weeks. The efficacy of crizotinib was later confirmed in two randomized, Phase III trials, 347 patients in PROFILE 1007 (crizotinib versus docetaxel or pemetrexed chemotherapy in the second-line setting)27 and 343 patients in PROFILE 1014 (crizotinib versus combination of platinum and pemetrexed chemotherapy in the first-line setting).28 In the first-line setting, crizotinib demonstrated superior ORR (74% versus 45%) and PFS (10.9 versus 7.0 months). Similar results were also reported in the second-line setting with an improved ORR (65% versus 20%) and PFS (7.7 versus 3.0 months). Crizotinib was also associated with better patient quality of life compared to cytotoxic chemotherapy. Visual disorders, nausea, vomiting, diarrhea, constipation, edema, fatigue, decreased appetite, dizziness, cough, and dyspnea were commonly seen with crizotinib. Crizotinib is currently the first-line standard of care for advanced ALK-positive NSCLC patients. More recently, the anticancer efficacy of crizotinib was investigated in metastatic NSCLC patients expressing genetic aberrations in ROS1, typically ~1%–2% of TKI-naive NSCLC patients. In this Phase I study of 50 patients with ROS1-positive tumors treated with crizotinib at the standard dose, the ORR was 72% with three complete responses and 33 partial responses, with similar tolerability as ALK-positive NSCLC patients.29 Based on these data, crizotinib was also approved for use in this second molecular subgroup of NSCLC. Nivolumab (Opdivo®; Bristol-Myers Squibb, Princeton, NJ, USA), a PD-1 receptor inhibitor, is the first immune checkpoint inhibitor approved for metastatic NSCLC with progression on or after platinum-based chemotherapy.6 The FDA-approved dose is 3 mg/kg intravenously every 2 weeks. Two Phase III trials led to nivolumab’s approval. The first trial was the CheckMate-017 trial, a randomized, open-label, international, Phase III study consisting of 272 patients with stage IIIB or IV squamous-cell NSCLC who had disease recurrence after one prior platinum-containing regimen.39 Nivolumab showed significant improvement in OS versus docetaxel. The median OS was 9.2 months (95% CI: 7.3–13.3) with nivolumab versus 6.0 months (95% CI: 5.1–7.3) with docetaxel (HR =0.59, 95% CI: 0.44–0.79, P<0.001). The ORR favored nivolumab (20%) over docetaxel (9%, P=0.008). The median PFS was 3.5 months with nivolumab versus 2.8 months with docetaxel (HR =0.62, 95% CI: 0.47–0.81, P<0.001). The most common adverse events seen with nivolumab were fatigue, decreased appetite, and asthenia versus docetaxel patients experiencing neutropenia, fatigue, alopecia, and nausea more often. Subgroup analyses showed that patients with at least 5% PD-L1 expression had an increase in OS with nivolumab over docetaxel. The second trial, the CheckMate-057 trial, was a randomized, open-label, international, Phase III study consisting of 582 patients with stage IIIB, IV, or recurrent nonsquamous NSCLC after radiation therapy or surgical resection who also had disease progression or recurrence during or after one prior platinum-based doublet regimen.38 Nivolumab had a significant improvement in OS over docetaxel. The median OS was 12.2 months (95% CI: 9.7–15.0) with nivolumab versus 9.4 months (95% CI: 8.1–10.7) with docetaxel (HR =0.73, 95% CI: 0.59–0.89, P=0.002). The ORR favored nivolumab (19%; 95% CI: 15–24) over docetaxel (12%; 95% CI: 9–17, P=0.02). The median PFS was 2.3 months in the nivolumab group versus 4.2 months in the docetaxel group (HR =0.92, 95% CI: 0.77–1.11, P=0.39). PD-L1 expression was also monitored, and in patients with at least 5% expression, there was an increase in OS with nivolumab over docetaxel. The adverse effects most frequently reported with nivolumab were fatigue, nausea, decreased appetite, and asthenia versus docetaxel patients experiencing neutropenia, fatigue, nausea, and alopecia. As of August 2016, results from the CheckMate-026 trial, investigating the use of nivolumab as monotherapy in patients with previously untreated advanced NSCLC whose tumors expressed PD-L1 of at least 5%, did not meet its primary endpoint of PFS as compared to investigator’s choice chemotherapy (gemcitabine/cisplatin, gemcitabine/carboplatin, or paclitaxel carboplatin in squamous NSCLC and pemetrexed/cisplatin or pemetrexed/carboplatin in non-squamous NSCLC).40 However, the impact on OS remains to be determined. Subsequently, pembrolizumab received approval to expand its second-line indication to all metastatic NSCLC patients with tumor PD-L1 expression of at least 1% based on the results of the KEYNOTE-010, a randomized, open-label, international, Phase II/III study of 1,034 patients with previously treated, PD-L1-positive, advanced NSCLC treated with pembrolizumab 2 mg/kg and 10 mg/kg, or docetaxel.43 The median OS was 10.4 months with pembrolizumab 2 mg/kg, 12.7 months with pembrolizumab 10 mg/kg, and 8.5 months with docetaxel. The OS was significantly longer with pembrolizumab 2 mg/kg versus docetaxel (HR =0.71, 95% CI: 0.58–0.88, P=0.0008) and with pembrolizumab 10 mg/kg versus docetaxel (HR =0.61, 95% CI: 0.49–0.75, P<0.0001). Among patients with tumors expressing at least 50% PD-L1, the median OS was significantly longer with pembrolizumab 2 mg/kg than with docetaxel (14.9 versus 8.2 months, HR =0.54, 95% CI: 0.38–0.77, P=0.0002) and with pembrolizumab 10 mg/kg than with docetaxel (17.3 versus 8.2 months, HR =0.50, 95% CI: 0.36–0.70, P<0.0001). Importantly, pembrolizumab is currently the only immune checkpoint inhibitor approved for the first-line treatment of advanced NSCLC in eligible molecular subtypes (PD-L1 high, EGFR negative, and ALK negative). This was based on KEYNOTE-024, a randomized open-label trial in 305 previously untreated metastatic NSCLC patients with tumor PD-L1 expression of at least 50% treated with pembrolizumab (200 mg every 3 weeks) or platinum-based chemotherapy.44 Pembrolizumab demonstrated a significant improvement in PFS (HR =0.50; 95% CI: 0.37–0.68; P<0.001) with a median PFS of 10.3 versus 6.0 months for those receiving platinum-based chemotherapy. A prespecified interim analysis also showed a significant improvement in OS (HR =0.60; 95% CI: 0.41–0.89; P<0.005). Atezolizumab (Tecentriq®; Genentech), a monoclonal antibody targeting the PD-L1 ligand, is approved for the treatment of metastatic NSCLC after the failure of platinum-containing chemotherapy treatment. This was based on two randomized, open-label clinical trials (OAK and POPLAR) in a total of 1,137 patients with NSCLC, comparing safety and efficacy of atezolizumab (1,200 mg every 3 weeks) with docetaxel.45,46 Treatment with atezolizumab significantly improved OS: the median OS was 13.8 months in OAK (95% CI: 11.8–15.7) compared to 9.6 months (95% CI: 8.6–11.2) in the docetaxel arm (HR =0.74; 95% CI: 0.63–0.87; P=0.0004). The median OS in POPLAR was 12.6 months (95% CI: 9.7–16.0) and 9.7 months (95% CI: 8.6–12.0) (HR =0.69; 95% CI: 0.52–0.92) for the atezolizumab and docetaxel arms, respectively. The most common adverse events in patients treated with atezolizumab were fatigue, decreased appetite, dyspnea, cough, nausea, musculoskeletal pain, and constipation. The most common serious adverse events were dyspnea, pneumonia, hypoxia, hyponatremia, fatigue, anemia, musculoskeletal pain, aspartate transaminase increase, alanine transaminase increase, dysphagia, and arthralgia. As the other immune checkpoint inhibitors, patients receiving atezolizumab also experienced immune-related adverse events, including pneumonitis, hepatitis, colitis, and thyroid disease. Vemurafenib (Zelboraf®; Genentech), approved for patients with unresectable or metastatic melanoma with BRAF V600E mutation, is a kinase inhibitor that has shown activity against NSCLC but is currently not approved in NSCLC.23,49 In a histology-independent Phase II study with seven cancer cohorts that were all BRAF V600 mutation positive, 20 patients were enrolled in the NSCLC cohort.49 The ORR was 42% (95% CI: 20–67) with eight partial responses. The median PFS was 7.3 months (95% CI: 3.5–10.8), the 12-month rate of PFS was 23% (95% CI: 6–46), and the preliminary 12-month OS was 66% (95% CI: 36–85). The median OS had not yet been reached. Rash and fatigue were commonly experienced by patients. Dabrafenib (Tafinlar®; Novartis) is a kinase inhibitor approved for patients with unresectable or metastatic melanoma with BRAF V600E mutations that has shown activity against NSCLC but not approved for NSCLC.37,38,50 In a multicenter, nonrandomized, open-label, Phase II study, 84 patients with previously treated (at least one line of chemotherapy) and untreated stage IV metastatic BRAF (V600E)-positive NSCLC were treated with oral dabrafenib 150 mg twice daily.50 Patients with EGFR mutations or ALK rearrangements were eligible as long as they received a prior EGFR or ALK inhibitor, respectively. Four of the six untreated patients receiving first-line treatment with dabrafenib had achieved a partial response. The ORR for the 78 patients receiving dabrafenib as a second-line or later treatment occurred in 26 patients (33%; 95% CI: 23–45) with all 26 patients achieving a partial response. The median DOR was 9.6 months (95% CI: 5.4–15.2) and the median PFS was 5.5 months (95% CI: 3.4–7.3). Another single-arm, two-stage, Phase II study utilized a combination of dabrafenib and trametinib, an MAPK/ERK kinase (MEK) inhibitor, in 24 evaluable patients with advanced BRAF (V600E)-positive NSCLC who failed at least one line of chemotherapy.38 The ORR was 63% (95% CI: 41–81) with 15 partial responses observed in 6 weeks. Common adverse effects reported with dabrafenib were pyrexia, diarrhea, nausea, vomiting, decreased appetite, asthenia, cough peripheral edema, fatigue, and rash. Trametinib (Mekinist®; Novartis), originally approved by the FDA in 2013 in combination with dabrafenib for the treatment of patients with unresectable or metastatic melanoma with BRAF V600E or V600K mutations, is an MEK inhibitor that has shown activity against NSCLC but not currently approved for this indication.38,39,51 As previously mentioned, trametinib has shown activity in combination with dabrafenib in NSCLC, but it has also proven to have activity as monotherapy.38,51 In an open-label, multicenter, randomized, Phase II study, 129 patients with KRAS-mutant stage IV NSCLC were randomly assigned 2:1 to trametinib or docetaxel.51 The median PFS was 12 weeks with trametinib versus 11 weeks in the docetaxel arm (HR =1.14, 95% CI: 0.75–1.75, P=0.5197). The median OS was 8 months in the trametinib arm and not reached in the docetaxel arm (HR =0.97, 95% CI: 0.52–1.83, P=0.934). There were 10 (12%) partial responses in the trametinib arm and five (12%) partial responses in the docetaxel arm (P=1.0000). Although the results were similar, the clinical significance cannot be fully elucidated due to the underwhelming results and small sample size. Rash, diarrhea, nausea, vomiting, and fatigue were the adverse events reported with trametinib. Cabozantinib (Cabometyx®; Exelixis, South San Francisco, CA, USA) is a multi-TKI approved for progressive metastatic medullary thyroid cancer that has shown activity against NSCLC but is not approved for NSCLC currently.39,40 In a single-center, open-label, Phase II study, 20 patients with rearranged during transfection stage IV NSCLC were administered cabozantinib 60 mg orally daily.39 The ORR was 28% (95% CI: 10–53) with five partial responses. The median PFS was 7 months (95% CI: 3 to not reached), and the median OS was not reached. Patients commonly experienced fatigue, diarrhea, palmar-plantar erythrodysesthesia, transaminitis, and thrombocytopenia. Indoximod (NLG-8189; NewLink Genetics, Ames, IA, USA), an indoleamine 2,3-dioxygenase (IDO) inhibitor, is an immune checkpoint inhibitor with activity in NSCLC.52 IDO is involved in increasing the number of immunosuppressive T-regulatory cells. Thus, an inhibitor of this pathway can reverse this effect. The only reported in-man Phase I trial studied the combination of docetaxel and indoximod in 29 patients with metastatic solid tumors.52 Of these patients, 10 patients had NSCLC, of whom two of them showed a reduction in tumor size (56.5% and 8.2%). Common adverse events experienced with the combination of docetaxel and indoximod included anemia, fatigue, and hyperglycemia. An area of much needed research in NSCLC is KRAS-mutated tumors. Currently, there are no FDA-approved therapies for such mutations. However, the BATTLE-2 trial (a biomarker-integrated targeted therapy study in previously treated patients with advanced non-small cell lung cancer) is poised to address this issue.53 This was a randomized, Phase II, multicenter, open-label study that included 200 patients with advanced NSCLC (excluding sensitizing EGFR mutations and ALK gene fusions) refractory to more than one prior therapy who were stratified based on KRAS mutation status. Patients were stratified to receive erlotinib (arm 1), erlotinib and MK-2206 (arm 2), MK-2206 and AZD6244 (arm 3), or sorafenib (arm 4). MK-2206 is an allosteric protein kinase B inhibitor, while AZD6244 is an MEK inhibitor, two agents with promise against KRAS-positive cancers. Twenty-seven percent of the study participants were KRAS mutant positive. The primary end-point was 8-week DCR. Overall, the DCR was 48% with 32% in arm 1, 50% in arm 2, 53% in arm 3, and 46% in arm 4. The DCR in KRAS mutant positive patients was 20% in arm 1, 25% in arm 2, 62% in arm 3, and 44% in arm 4. In KRAS wild-type patients, the DCR was 36% in arm 1, 57% in arm 2, 49% in arm 3, and 47% in arm 4. Patients with KRAS mutant positive tumors experienced a statistically longer PFS if treated with therapy that did not contain erlotinib with a median PFS of 1.8 months with arms 1 and 2 combined versus 2.5 months with arms 3 and 4 combined (HR =1.95, 95% CI: 1.00–3.77, P=0.04). However, there was no difference in OS seen among patients who were KRAS mutant positive receiving erlotinib or not. The most common grade 3/4 adverse effect seen in the combined MK-2206/AZD6244 arm was maculopapular rash. The World Health Organization estimated that there were 1.53 million new cases of NSCLC in 2012. 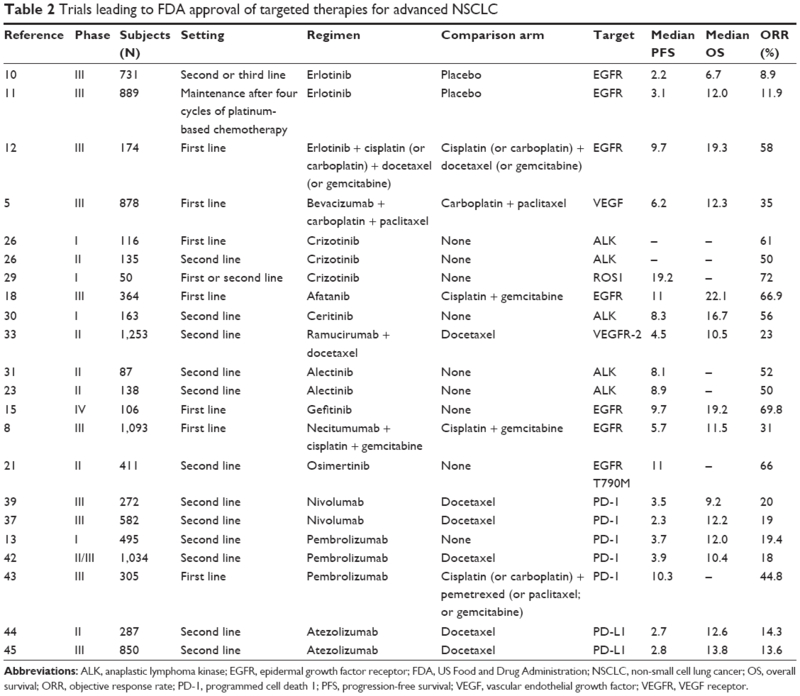 In addition, 75% of these patients will progress to have metastatic diseases.54 Currently, a category 1 recommendation is in place from the National Comprehensive Cancer Network for nivolumab as second-line therapy for advanced or metastatic NSCLC of either squamous etiology or nonsquamous etiology.15 Nivolumab will have a significant impact on this population of patients because of its clinical efficacy and its economic costs. Nivolumab has a yearly cost of ~$64,860,55 which, according to Walstra, was not cost-effective compared to docetaxel in all patients treated with NSCLC in the Swiss Health Care System ($177,478/quality-adjusted life year (QALY) versus $133,267/QALY, respectively, in US$). However, when looking at patients with PD-L1 status at both 1% and 10%, PD-L1 expression produces an incremental cost-effectiveness ratio of $65,744/QALY and $37,860/QALY, respectively,55 thus significantly increasing the years gained compared to docetaxel. More research needs to be done to determine its cost-effectiveness in the US health care system. The results from CheckMate-026 and KEYNOTE-001 beg the question, “Does measuring PD-L1 expression matter to determine if a favorable result will occur?” Currently, the efficacy and economic data suggest that monitoring for PD-L1 expression may be worthwhile in determining whether to utilize an immune checkpoint inhibitor in advanced NSCLC. Although nivolumab did not meet its PFS endpoint as first-line therapy in the patients with advanced NSCLC, additional analyses are underway to determine whether raising the PD-L1 expression threshold can identify patients more likely to benefit from treatment and other trials are ongoing to determine whether nivolumab combined with other treatments yields clinical benefits in the second-line treatment of NSCLC. This will be further compounded by the introduction of PD-1/PD-L1-directed therapy in the first-line setting in NSCLC. With the approval of pembrolizumab in the first-line setting, we are now seeing an evolution in the role of PD-1-directed therapy. Pembrolizumab is approved under very specific indications in the first-line setting, with the most important being the requirement of >50% PD-L1 expression.41 It is important to recognize that this may only represent a small proportion of patients who express this level of PD-L1 (~25% of those screened).41 In contrast, the original nivolumab trials did not require expression to utilize nivolumab for treatment. The available evidence in lung cancer suggests that PD-L1 expression is not only a predictor of response, but it will also be a requirement for future drug approval in order to compete with pembrolizumab’s place in therapy. Trials are underway evaluating the combination of nivolumab and ipilimumab, or platinum chemotherapeutic agents, or erlotinib for treatment-naive advanced NSCLC.48 Interestingly, nivolumab is also being evaluated in early-stage NSCLC as adjuvant therapy postsurgery and chemotherapy.56,57 Ultimately, the combinations and possibilities with nivolumab for NSCLC are multiple, and the findings from these current as well as future research efforts will clarify the role of nivolumab in the management of NSCLC. Borghaei H, Paz-Ares L, Spigel DR, et al. Nivolumab versus docetaxel in advanced nonsquamous non-small-cell lung cancer. N Engl J Med. 2015;373(17):1627–1639. Arteaga CL. Overview of epidermal growth factor receptor biology and its role as a therapeutic target in human neoplasia. Semin Oncol. 2002;29(5 suppl 14):3–9. Matikas A, Mistiotis D, Georgoulias V, Kotaskis A. Current and future approaches in the management of non-small-cell lung cancer patients with resistance to EGFR TKIs. Clin Lung Cancer. 2015;16(4):252–261. van der Wekken AJ, Saber A, Hiltermann TJ, Kok K, van den Berg A, Groen HJ. Resistance mechanisms after tyrosine kinase inhibitors afatinib and crizotinib in non-small cell lung cancer, a review of the literature. Crit Rev Oncol Hematol. 2016;100:107–116. Sandler A, Gray R, Perry MC, et al. Paclitaxel-carboplatin alone or with bevacizumab for non-small-cell lung cancer. N Engl J Med. 2006;355(24):2542–2550. Pirker R, Pereira JR, Szczesna A, et al; FLEX Study Team. Cetuximab plus chemotherapy in patients with advanced non-small-cell lung cancer (FLEX): an open-label randomised phase III trial. Lancet. 2009;373(9674):1525–1531. Higgins JP, Green S, editors. Cochrane Handbook for Systematic Reviews of Interventions: The Cochrane Collaboration. Chichester, UK: John Wiley & Sons, Ltd; 2011. Thatcher N, Hirsch FR, Luft AV, et al; SQUIRE Investigators. Necitumumab plus gemcitabine and cisplatin versus gemcitabine and cisplatin alone as first-line therapy in patients with stage IV squamous non-small-cell lung cancer (SQUIRE): an open-label, randomised, controlled phase 3 trial. Lancet Oncol. 2015;16(7):763–774. Middleton MR, Dalle S, Claveau J, et al. Real-world treatment practice in patients with advanced melanoma in the era before ipilimumab: results from the IMAGE study. Cancer Med. 2016;5(7):1436–1443. Shepherd FA, Rodrigues Pereira J, Ciuleanu T, et al; National Cancer Institute of Canada Clinical Trials Group. Erlotinib in previously treated non-small-cell lung cancer. N Engl J Med. 2005;353(2):123–132. Cappuzzo F, Ciuleanu T, Stelmakh L, et al; SATURN investigators. Erlotinib as maintenance treatment in advanced non-small-cell lung cancer: a multicentre, randomised, placebo-controlled phase 3 study. Lancet Oncol. 2010;11(6):521–529. Rosell R, Carcereny E, Gervais R, et al; Spanish Lung Cancer Group in collaboration with Groupe Français de Pneumo-Cancérologie and Associazione Italiana Oncologia Toracica. Erlotinib versus standard chemotherapy as first-line treatment for European patients with advanced EGFR mutation-positive non-small-cell lung cancer (EURTAC): a multicentre, open-label, randomised phase 3 trial. Lancet Oncol. 2012;13(3):239–246. Kazandjian D, Blumenthal GM, Yuan W, He K, Keegan P, Pazdur R. FDA approval of gefitinib for the treatment of patients with metastatic EGFR mutation-positive non-small cell lung cancer. Clin Cancer Res. 2016;22(6):1307–1312. Puzanov I, Dummer R, Schachter J, et al. Efficacy based on tumor PD-L1 expression in KEYNOTE-002, a randomized comparison of pembrolizumab (pembro; MK-3475) versus chemotherapy in patients (pts) with ipilimumab-refractory (IPI-R) advanced melanoma (MEL). Poster presented at: 2015 ASCO Annual Meeting; May 29-June 2, 2015; Chicago, IL. Available from: http://meetinglibrary.asco.org/content/150479-156. Accessed February 14, 2017. Douillard JY, Ostoros G, Cobo M, et al. First-line gefitinib in Caucasian EGFR mutation-positive NSCLC patients: a phase-IV, open-label, single-arm study. Br J Cancer. 2014;110(1):55–62. Inoue A, Kobayashi K, Maemondo M, et al. Updated overall survival results from a randomized phase III trial comparing gefitinib with carboplatin-paclitaxel for chemo-naive non-small cell lung cancer with sensitive EGFR gene mutations (NEJ002). Ann Oncol. 2013;24(1):54–59. Gelao L, Criscitiello C, Esposito A, Goldhirsch A, Curigliano G. Immune checkpoint blockade in cancer treatment: a double-edged sword cross-targeting the host as an “innocent bystander”. Toxins. 2014;6(3):914–933. Wu YL, Zhou C, Hu CP, et al. Afatinib versus cisplatin plus gemcitabine for first-line treatment of Asian patients with advanced non-small-cell lung cancer harbouring EGFR mutations (LUX-Lung 6): an open-label, randomised phase 3 trial. Lancet Oncol. 2014;15(2):213–222. Mantel N, Haenszel W. Statistical aspects of the analysis of data from retrospective studies of disease. J Natl Cancer Inst. 1959;22:719–748. Liao BC, Lin CC, Yang JC. Second and third-generation epidermal growth factor receptor tyrosine kinase inhibitors in advanced nonsmall cell lung cancer. Curr Opin Oncol. 2015;27(2):94–101. Yang J, Ramalingam SS, Janne PA, Cantarini M, Mitsudomi T. LBA2_PR: Osimertinib (AZD9291) in pre-treated pts with T790M-positive advanced NSCLC: updated Phase 1 (P1) and pooled Phase 2 (P2) results. J Thorac Oncol. 2016;11(4 suppl):S152–S153. Facchinetti F, Tiseo M, Maio MD, et al. Tackling ALK in non-small cell lung cancer: the role of novel inhibitors. 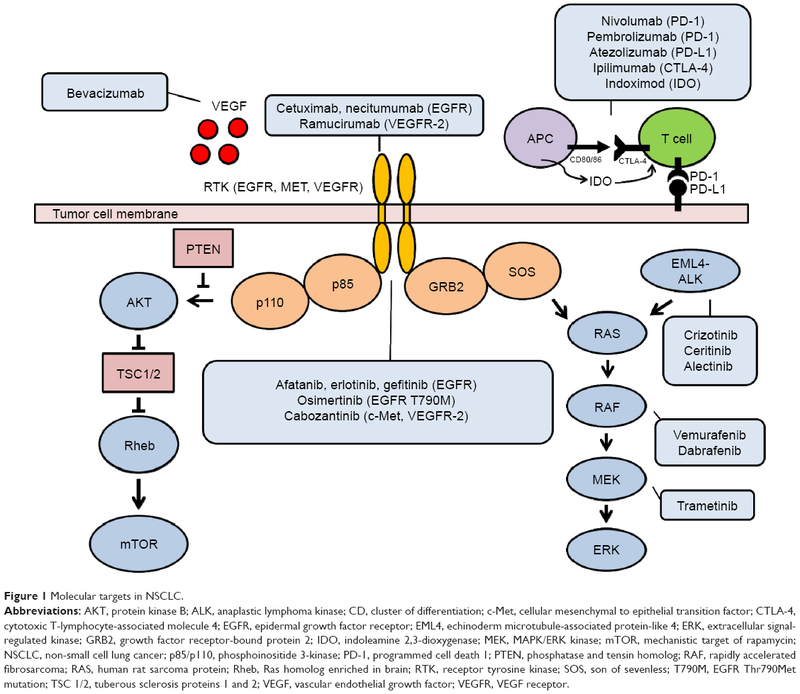 Transl Lung Cancer Res. 2016;5(3):301–321. Ou SH, Ahn JS, De Petris L, et al. Alectinib in crizotinib-refractory ALK-rearranged non-small-cell lung cancer: a phase II global study. J Clin Oncol. 2016;34(7):661–668. Rothschild S. New treatment options for ALK+ advanced non-small-cell lung cancer: critical appraisal of ceritinib. Ther Clin Risk Manag. 2016;12:735–741. Johnson DB, Estrada MV, Salgado R, et al. Melanoma-specific MHC-II expression represents a tumour-autonomous phenotype and predicts response to anti-PD-1/PD-L1 therapy. Nat Commun. 2016;7:10582. Malik SM, Maher VE, Bijwaard KE, et al. U.S. Food and Drug Administration approval: crizotinib for treatment of advanced or metastatic non-small cell lung cancer that is anaplastic lymphoma kinase positive. Clin Cancer Res. 2014;20(8):2029–2034. Shaw AT, Kim DW, Nakagawa K, et al. Crizotinib versus chemotherapy in advanced ALK-positive lung cancer. N Engl J Med. 2013;368(25):2385–2394. Solomon BJ, Mok T, Kim DW, et al; PROFILE 1014 Investigators. First-line crizotinib versus chemotherapy in ALK-positive lung cancer. N Engl J Med. 2014;371(23):2167–2177. Shaw AT, Ou SH, Bang YJ, et al. Crizotinib in ROS1-rearranged non-small-cell lung cancer. N Engl J Med. 2014;371(21):1963–1971. Kim DW, Mehra R, Tan DS, et al. Activity and safety of ceritinib in patients with ALK-rearranged non-small-cell lung cancer (ASCEND-1): updated results from the multicentre, open-label, phase 1 trial. Lancet Oncol. 2016;17(4):452–463. Shaw AT, Gandhi L, Gadgeel S, et al; Study Investigators. Alectinib in ALK-positive, crizotinib-resistant, non-small-cell lung cancer: a single-group, multicentre, phase 2 trial. Lancet Oncol. 2016;17(2):234–242. National Comprehensive Cancer Network. Non-small cell lung cancer (version 4.2017). Available from: https://www.nccn.org/professionals/physician_gls/pdf/nscl.pdf. Accessed February 14, 2017. Hasani A, Leighl NB. Targeting vascular endothelial growth factor in lung cancer. J Thorac Oncol. 2010;5(12 suppl 6):S484–S486. Garon EB, Ciuleanu TE, Arrieta O, et al. Ramucirumab plus docetaxel versus placebo plus docetaxel for second-line treatment of stage IV non-small-cell lung cancer after disease progression on platinum-based therapy (REVEL): a multicentre, double-blind, randomised phase 3 trial. Lancet. 2014;384(9944):665–673. Drake CG, Jaffee E, Pardoll DM. Mechanisms of immune evasion by tumors. Adv Immunol. 2006;90:51–81. Pardoll D. The blockade of immune checkpoints in cancer immunotherapy. Nav Rev Cancer. 2012;12(4):252–264. La-Beck N, Jean G, Huynh C, Alzghari S, Lowe D. Immune checkpoint inhibitors: new insights and current place in cancer therapy. Pharmacotherapy. 2015;35(10):963–976. Borghaei H, Paz-Ares L, Horn L, et al. Nivolumab versus docetaxel in advanced nonsquamous non-small-cell lung cancer. N Engl J Med. 2015;373(17):1627–1639. Brahmer J, Reckamp K, Baas P, et al. Nivolumab versus docetaxel in advanced squamous-cell non-cell lung cancer. N Engl J Med. 2015;373:123–135. Bristol-Meyers Squibb. Bristol-Myers Squibb Announces Top-Line Results from CheckMate -026, a Phase 3 Study of Opdivo (nivolumab) in Treatment-Naïve Patients with Advanced Non-Small Cell Lung Cancer. Available from: http://investor.bms.com/investors/news-and-events/press-releases/press-release-details/2016/Bristol-Myers-Squibb-Announces-Top-Line-Results-from-CheckMate--026-a-Phase-3-Study-of-Opdivo-nivolumab-in-Treatment-Nave-Patients-with-Advanced-Non-Small-Cell-Lung-Cancer/default.aspx. Accessed February 14, 2017. Garon EB, Rizvi NA, Hui R, et al. Pembrolizumab for the treatment of non-small-cell lung cancer. N Engl J Med. 2015;372(21):2018–2028. Hui R, Gandhi L, Costa EC, et al. Long-term OS for patients with advanced NSCLC enrolled in the KEYNOTE-001 study of pembrolizumab (pembro). Poster presented at: 2016 ASCO Annual Meeting; June 3–7, 2016. Chicago, IL, USA. Available from: http://meetinglibrary.asco.org/content/167384-176. Accessed August 10, 2016. Herbst RS, Baas P, Kim DW, et al. Pembrolizumab versus docetaxel for previously treated, PD-L1-positive, advanced non-small-cell lung cancer (KEYNOTE-010): a randomised controlled trial. Lancet. 2016;387(10027):1540–1550. Reck M, Rodriguez-Abreu D, Robinson AG, et al. Pembrolizumab versus chemotherapy for PD-L1-positive non-small-cell lung cancer. N Engl J Med. 2016;375(19):1823–1833. Fehrenbacher L, Spira A, Ballinger M, et al; POPLAR Study Group. Atezolizumab versus docetaxel for patients with previously treated non-small-cell lung cancer (POPLAR): a multicentre, open-label, phase 2 randomised controlled trial. Lancet. 2016;387(10030):1837–1846. Barlesi F, Park K, Ciardiello F, et al. Primary analysis from OAK, a randomized phase III study comparing atezolizumab with docetaxel in 2L/3L NSCLC. Abstract LBA44_PR presented at: European Society for Medical Oncology 2016 Congress, Copenhagen, Denmark, October 7–11, 2016. Available at: http://www.esmo.org/Conferences/ESMO-2016-Congress/Press-Media/Significant-Survival-Gains-with-Atezolizumab-vs-Docetaxel-for-Non-Small-Cell-Lung-Cancer. Accessed February 14, 2017. Topalian SL, Hodi FS, Brahmer JR, et al. Safety, activity, and immune correlates of anti-PD-1 antibody in cancer. N Engl J Med. 2012;366(26):2443–2454. Hellman M, Gettinger S, Goldman J, et al. CheckMate 012: Safety and efficacy of first-line (1L) nivolumab (nivo; N) and ipilimumab (ipi; I) in advanced (adv) NSCLC. Paper presented at: ASCO 2016; June 3–7, 2016; Chicago, IL, USA. Hyman DM, Puzanov I, Subbiah V, et al. Vemurafenib in multiple nonmelanoma cancers with BRAF V600 mutations. N Engl J Med. 2015;373(8):726–736. Planchard D, Kim TM, Mazieres J, et al. Dabrafenib in patients with BRAF(V600E)-positive advanced non-small-cell lung cancer: a single-arm, multicentre, open-label, phase 2 trial. Lancet Oncol. 2016;17(5):642–650. Blumenschein GR Jr, Smit EF, Planchard D, et al. A randomized phase II study of the MEK1/MEK2 inhibitor trametinib (GSK1120212) compared with docetaxel in KRAS-mutant advanced non-small-cell lung cancer (NSCLC) dagger. Ann Oncol. 2015;26(5):894–901. Soliman HH, Jackson E, Neuger T, et al. A first in man phase I trial of the oral immunomodulator, indoximod, combined with docetaxel in patients with metastatic solid tumors. Oncotarget. 2014;5(18):8136–8146. Papadimitrakopoulou V, Lee JJ, Wistuba II, et al. The BATTLE-2 Study: a biomarker-integrated targeted therapy study in previously treated patients with advanced non-small-cell lung cancer. J Clin Oncol. Epub 2016 Aug 1.
WHO. Lung cancer: estimated incidence, mortality and prevalence worldwide in 2012; WHO; 2012. Available from: http://globocan.iarc.fr/old/FactSheets/cancers/lung-new.asp. Accessed February 14, 2017. Tartari F, Santoni M, Burattini L, Mazzanti P, Onofri A, Berardi R. Economic stability of anti-PD-1 agent nivolumab and pembrolizumab in cancer patients: recent insights and future challenges. Cancer Treat Rev. 2016;48:20–24. Chaft J. Nivolumab after surgery and chemotherapy in treating patients with stage IB-IIIA non-small cell lung cancer (ANVIL); 2016. Available from: https://clinicaltrials.gov/ct2/show/NCT02595944. NLM identifier: NCT02595944. Accessed October 25, 2016. Squibb B-M. A trial of nivolumab, or nivolumab plus ipilimumab, or nivolumab plus platinum-doublet chemotherapy, compared to platinum doublet chemotherapy in patients with stage IV non-small cell lung cancer (NSCLC) (checkmate 227); 2016. Available from: https://clinicaltrials.gov/ct2/show/NCT02595944. NLM identifier: NCT02595944. Accessed October 25, 2016.